I’m very proud of the collaboration that I’ve built with Clayton State University’s Center for Continuing Education. 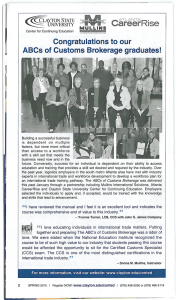 I teach a class entitled “The ABC’s of Customs Brokerage”, designed to meet the needs of logistics providers in the Atlanta area who are seeking qualified candidates to fill job openings in their businesses. Even more importantly, this gives people looking to start or advance a career in logistics and Customs brokerage the chance to get the kind of introductory skills to step into an entry level of position and immediately contribute. Click the picture to download this article. We have two more sessions of this class scheduled already for 2015. The first begins next month for students currently enrolled at Clayton State University in the Logistics and Supply Chain Management program, October’s class will be open to the trade community at large. For more information, click on the image to download a .pdf of the article from Clayton State University about the course as well as more information about why it’s important. To learn more about the class, visit Clayton State University at this link.